Ask fellow campers about "Collier-Seminole State Park" and nearby attractions. Site 96. Long enough for coach and wide enough to park dolly and car next to it. Sites on the outer side of the perimeter road are generally larger. Lots of dirt. If it rains, it gets muddy. Adjoining sites a little close but not too bad. 50 amp and water. Easy access to dump station but follow the sign, not the arrow, on the roadway. Good showers, warm enough but never really got hot. Bad bugs. We camped at Collier-Seminole State Park in a Motorhome. Everglades City Museum and the Smallwood Store Museum in Chokoloskee are worth seeing. We enjoyed the boat tour at Smallwood Store, too. Shark City is 60 miles from the park but the tram tour is worth the drive. Make reservations in winter months and go as early as you can. Joey D's in Marco Island was very good. This was our second stay at this park. It is only about a 40 minute drive from our house. The park in my opinion is rustic and very quiet at night. There is some road noise if you have a site on the north end of the CG. The bathroom was clean and the showers had good water pressure. We were there during snowbird season so there were a lot of out of state campers. I made my reservation about 10 months out as I know how hard it is to get a site during the winter. Weather was cool so the bugs were no problem. The boat ramp/ canoe launch is just a short drive or walk away. All the roads are one way so getting to the dump station is a little challenging as it is located on the road coming into the CG. This CG is very close to Marco Island with good places to go to eat. We will be returning at the end of April for a long weekend. Great place for us to relax and unwind. We camped at Collier-Seminole State Park in a Travel Trailer. Well, have to agree with everyone else. Here we were in January and the mosquitoes were still everywhere. Didn't sit outside at all. The sites were close, not like most other state parks we've been to. Site 49 which was long and fit our RV, was almost impossible to back into because of the trees on both sides and these "hitching posts" they have placed randomly around the sites. We had to move to another site the next day, 103, and that was a lot easier to back into. However, our front window was right across from another RV, so there was no privacy at all. While there might have been a couple of little walkways, indicating dog walk, there were no trash receptacles around. We were very disappointed in this state park. The hosts and staff worked hard though and did keep up the appearance of the park. Easy in and out to sites, verizon was weak, satellite worked, grass and little pebbles, picnic table and fire pit. We camped at Collier-Seminole State Park in a Motorhome. Marco Island is nearby, Naples was about 25 minutes. Pretty city, lots of good restaurants. The sites are all in a grassy field with a few trees. The mosquitoes were absolutely horrendous. We could not sit outside even with deet. This was definitely not our favorite park. The park staff was very nice though. We camped at Collier-Seminole State Park in a Travel Trailer. Go see the Everglades NP and dine in Marco Island. The approach roads are all blacktop and utility boxes are all new. The sites are mixture of sand and dirt and some were a little tight for larger rigs. Overall the campground was shady and clean. The mosquitoes were troublesome but generally our bug repellent worked well. We had satellite reception on both of our sites. Cell phone reception was poor. Kayaking was down a tree shaded channel leading to the Gulf. we never made it that far but turned around after an hour and paddled back. The staff and volunteers were helpful and friendly. We camped at Collier-Seminole State Park in a Travel Trailer. Little Bar in Goodland was within a 30 minute drive, good food at reasonable prices. Kirks sea food next door had a great variety of fish and stone crabs. Marco Island had good selection of stores including Publix and Home Depot. We really wanted to like this State Park, especially since we read it was recently redone. Unfortunately, it was a major letdown. Sure, the new comfort station was nice (although whomever designed the sidewalk and entrance needs to be fired), but the campground was very crowded with some super tight sites. We saw a few that you couldn't even put an awning out without hitting your neighbor. We saw zero appeal to the park except for an easy drive to Marco Island. To add insult to injury, the mosquitos were horrific!! We couldn't be outside without covering our entire bodies with clothing and/or mosquitoe spray, and they still bit us! We lasted 5 days of our 14 day reservations before bugging out (pun intended). We were ready to leave after the first day, but had trouble finding openings anywhere else. No way we'll be back. Verizon was mediocre, some sites had clear sky view for satellite reception. We camped at Collier-Seminole State Park in a Motorhome. This state park would have been great except for the mosquitoes! They were awful. We were told that they don't spray for mosquitoes anymore by a fellow camper (don't know if that's true or not) but we were not able to hike even with repellent on. We did bike a lot, though, and that kept the mosquitoes off. The restrooms were flooded on the men's side one day, with sewage and standing water. When we called, they promptly came to address the issue. Site was level and utilities worked as expected (electric and water). We camped at Collier-Seminole State Park in a Motorhome. We particularly enjoyed the kayaking from the park. It is a convenient location for visiting the western end of the Everglades National Park. Naples is also nearby. Several nature trails are on the park grounds as well as some historic spots. 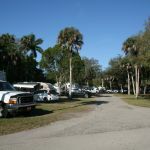 We camped at Collier-Seminole State Park in a Motorhome. Lots of interesting history in park, but not too time consuming. Can walk dogs but are asked to keep them on a lead even in the field that looks like it was made to throw a ball! Great staff! We camped at Collier-Seminole State Park in a Travel Trailer. Visit Marco Island & there are stores & laundry mats within 15 minutes. Renovations were recently completed to this park and it is nice. Paved loop roads, new and well kept bath houses. 50/30/30 electric. The sites are gravel and level. Some are close together and some not so. There are a few with privacy shrubs in between and all are shady to partially shady. Great staff! Maintenance and cleaning on going for your pleasure. There is a .9 mile nature trail into the marsh, a 3.5 bike/hike trail through the marsh and hammock and a 6.5 mile hike trail through a wet cypress swamp. There is also a boat ramp, playground and a couple of interesting historical things to see. Plenty to see and do or just rest and relax. The park was really quiet, despite being close to SR92. Little traffic. There is a tent specific loop and group camping area. There are ample paved roads to bike/walk, or do the bike trail. We camped at Collier-Seminole State Park in a Motorhome. Hike the short nature trail into a hammock and the marsh, try kayaking in the marsh. Visit the old dredge. There is a field near the loops to star gaze. The marsh has plenty of birds to observe from a lookout on the nature trail or at the boat ramp/playground area. Naples is not far if you need supplies/entertainment, or there is a "convenience" store just down the road. About 3 miles east is Ten Thousand Islands Nat'l Wildlife Refuge. Worth a visit. Very beautiful campground, spacious site, very few other campers, super staff. Had to leave campground early due to death in family. We would camp at this campground again. We camped at Collier-Seminole State Park in a Fifth Wheel. We stayed here November 2014. Our site had water and electric. Dump station is on the exit road. I will stay here again. After dusk, there are very many mosquitos. During winter, reservations are a good idea. We camped at Collier-Seminole State Park in a Travel Trailer. Nearby fishing, boat access, rental canoe & kayak. I recommend the many professional fishing guided trips from Chokoloskee, FL. I have done this many times. I recommend the Turner River pole boat guided trip. I recommend the tram ride and wildlife viewing at Shark Valley entrance to Everglades NP. Small grass campsites, overrun with people in the spring. Lots of mosquitos but this is the Everglades! Good place for canoeing. Restroom/Shower facilities are disgusting. Where is the beach? Only beaches within a reasonable drive are very limited on Marco Island. We camped at Collier-Seminole State Park in a Travel Trailer. We stayed over the weekend of the annual bluegrass festival, and the campground was packed. As stated before, the sites are very tight and lack definition. We had tents on each side of our RV in the space of one average campsite. The two couples on our right had 5 kids for a total of 9 people, with two tents and two cars. Thank goodness they were a delightful family or this set-up would have been way too cozy. Some sites looked larger and probably much harder to reserve. There were many weekend campers, walking from site to site to visit, music playing, and loud talking. Many campfires were burning, off and on all day and into the evening. With being so close, it was hard to avoid the drifting smoke. The front bathrooms located in the rec hall building had been remodeled and were very nice, but there were only two stools, two sinks, and one shower. The larger bathhouse in the center of the campground was overdue for a remodel. The campground is in a remote location, not much within 5 miles of the park. We did visit the Everglades while here and drove over to Marco Island. We normally prefer State Parks over private RV parks. This one would be the exception. We camped at Collier-Seminole State Park in a Motorhome. Small sites and somewhat difficult to get into. Had to get several people to move their vehicle to get into site. Extremely busy during the weekend. Stay away from the sites near the sewer dump...stinky. Our site was private but backed onto the road that led to Marco Island. Traffic noise. Some hiking nearby. Quaint bar about 1/2 mile away. Showers ok. AT&T deadspot. Could get some wifi near boat launch. We camped at Collier-Seminole State Park in a Travel Trailer. Good value for money in Naples area. Nearby fishing, boat access, rental canoe & kayak. I recommend the many professional fishing guided trips from Chokoloskee, FL. I have done this many times. I recommend the Turner River pole boat guided trip. I recommend the tram ride and wildlife viewing at Shark Valley entrance to Everglades NP. Are you affiliated with Collier-Seminole State Park ?